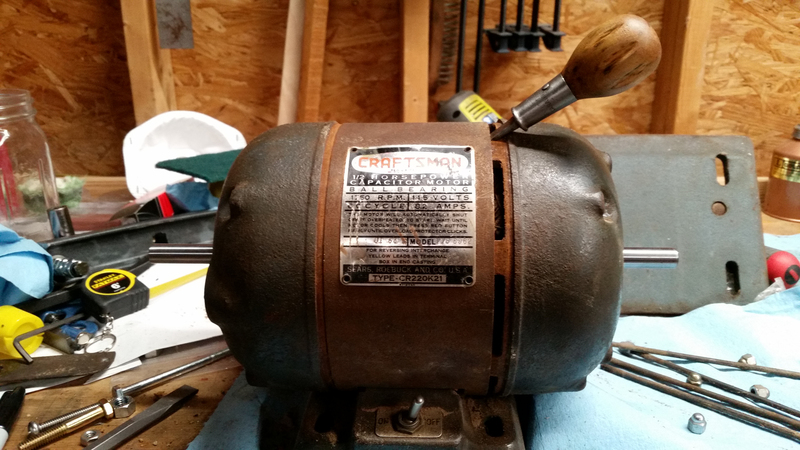 Craftsman 115.6962 1/2-HP Capacitor Start Electric Motor. 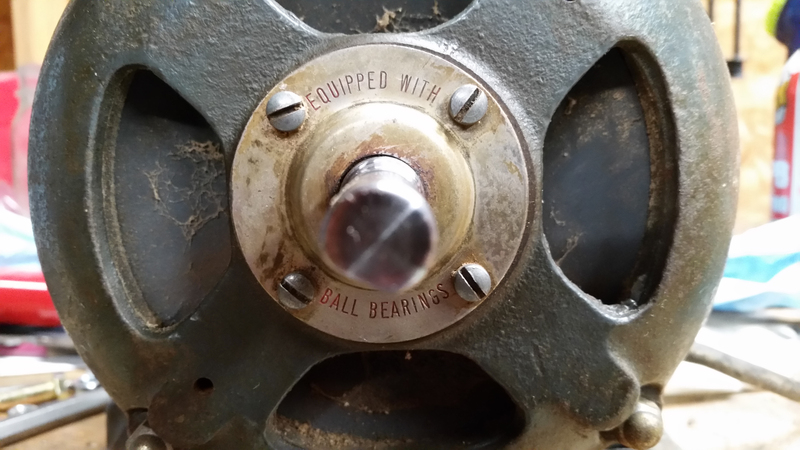 Detail of bearing assembly. 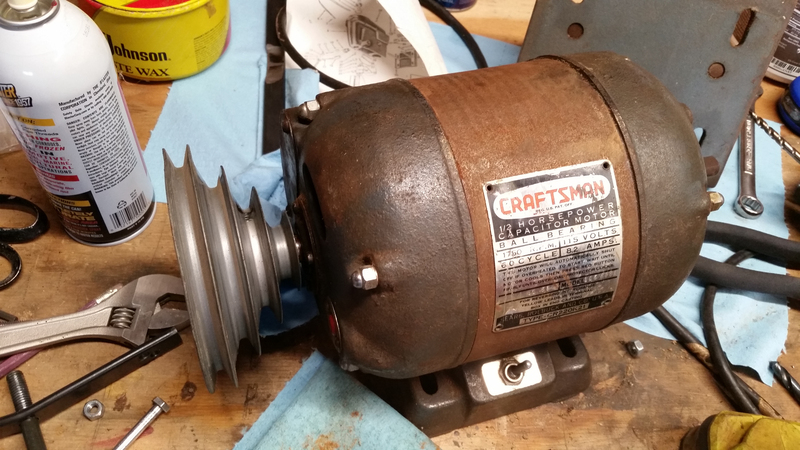 In this post, I will talk about removing the old motor bearings and ordering new ones for a Craftsman 115.6962 capacitor start 1/2 -HP electric motor (115 V, 60 cycles, 1750 RPM). 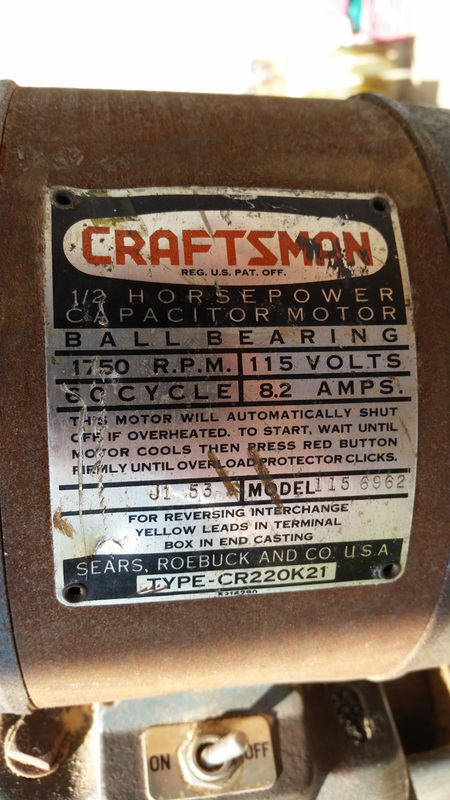 Here’s the original Craftsman manual at VintageMachinery.org. 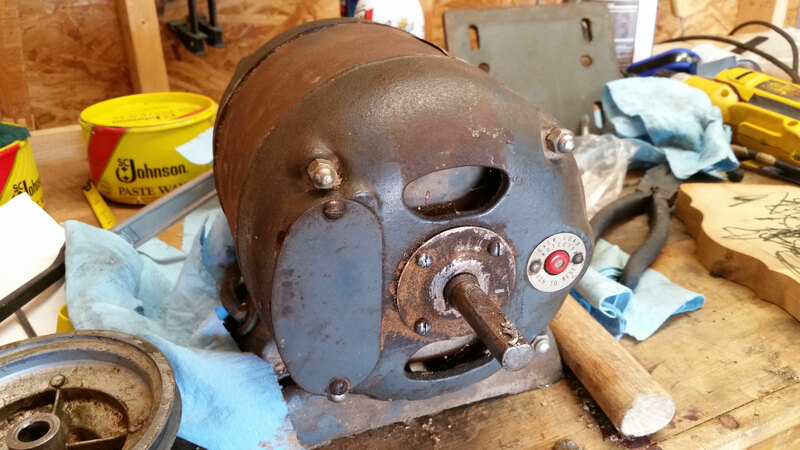 The first step in restoring the motor was to remove the stuck-on pulley on the left side (terminal side) shaft of the motor. First, I removed the set screw, but from there, the pulley wasn’t budging. At all. I think the problem was a little corrosion between the pulley and the shaft, plus some galling of the shaft from the set screw. There wasn’t much room to get a puller in behind the pulley, and I was very reluctant to use a puller anyway, lest I damage the very soft metal of the pulley. In the end, I set up an adjustable wrench on the fan side shaft to prevent the shaft from turning. Then I applied as much elbow grease as possible and tried to turn the pulley on the shaft. After a lot of grunting, cussing, and shots of penetrating oil, I got it to turn about a few mm. 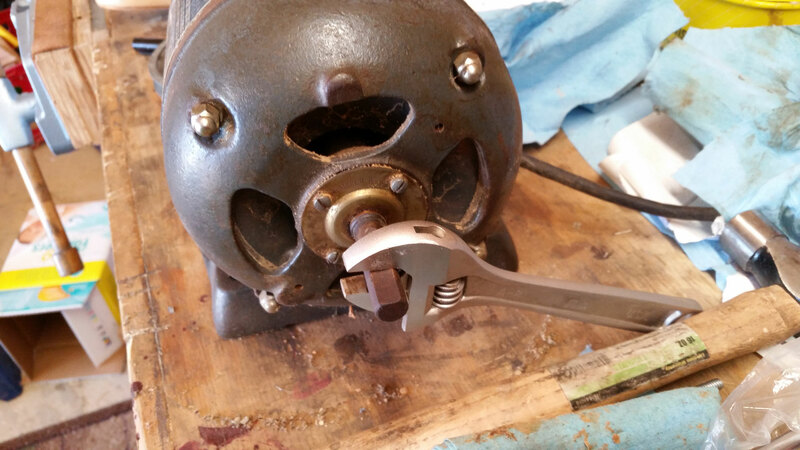 Then, I reversed the adjustable wrench and tried to turn the pulley in the other direction. Back and forth I turned it, getting it to move a few mm one way and then the other, slowly loosening it up. After a point, I tried to pull it out with a homemade puller and got it to move outboard a half inch or so. Progress! Then it was a few more rounds of turning against the adjustable wrench, work with the puller, and finally I got the *$^#@%% pulley off, basically intact. An adjustable wrench prevented the shaft from moving while I wiggled the pulley. The left shaft was rusty, dirty, a little galled, and basically just a mess. 65 years of rust and some flaked metal from the pot metal pulley. 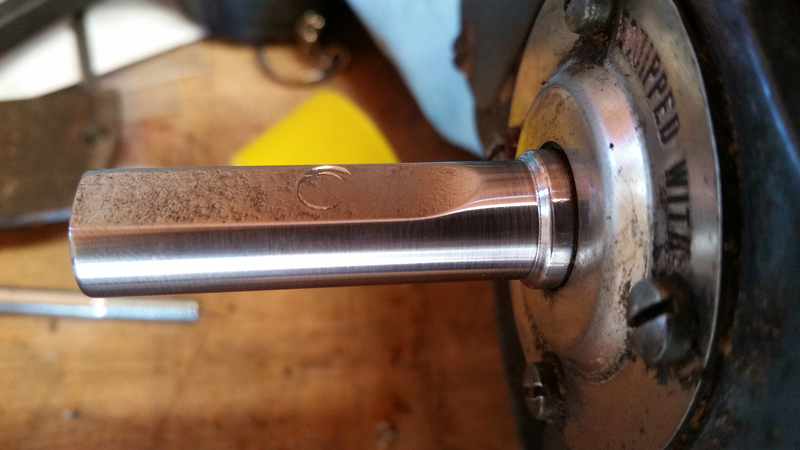 I ran the motor a little and applied some fine grit sandpaper to the shafts to clean them up a bit. I also used a little simple green on a shop towel to get some of the grime off the bearing housing. The shaft cleaned up nicely. You can see where the set screw gouged the shaft on the flat. Here’s the outer cap covering the bearing. I removed the four screws and pulled off a series of washers and gaskets. 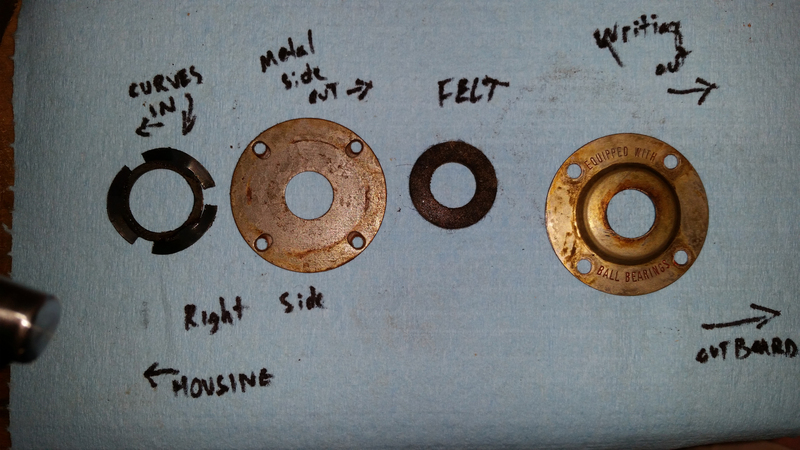 Right side / Fan side: From inboard to outboard (L-R in the photo): (1) bearing spring for keeping thrust tension on the bearing; (2) end cap (the fiber washer was on the underside of the metal washer and faces inboard); (3) felt gasket; (4) felt retainer. The left side / Terminal side is the same, but lacks a spring. WIth the springs and washers removed, I could visualize the ball bearing. 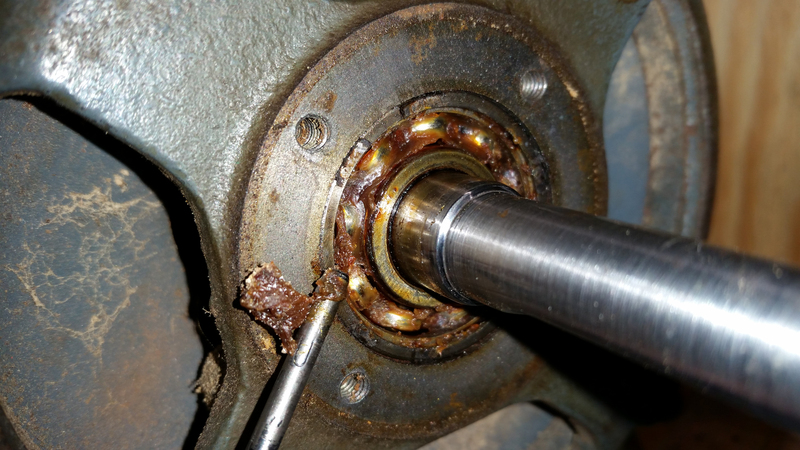 The bearings are un-shielded on the outboard side, and you could probably clean and re-grease them if desired. I was planning on replacing them. Ok, so at this point, the bearing itself was really all that was holding the end frames together. 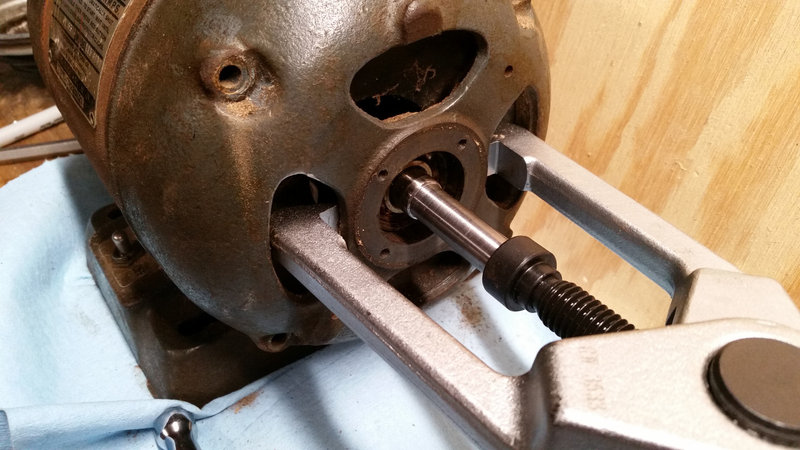 To separate the frames, I used a Gearwrench bearing separator to push into the rotor shaft while pulling on the frame. I do not necessarily recommend this approach – it could easily crack the end frame casting. It worked for me, but I am sure there’s a better way to go about this. The right side (fan side) end frame is bored so the bearing can pass straight through, but the left side has a lip on the interior surface of the bearing housing and the bearing can only be installed or removed through the outside (it won’t push through). 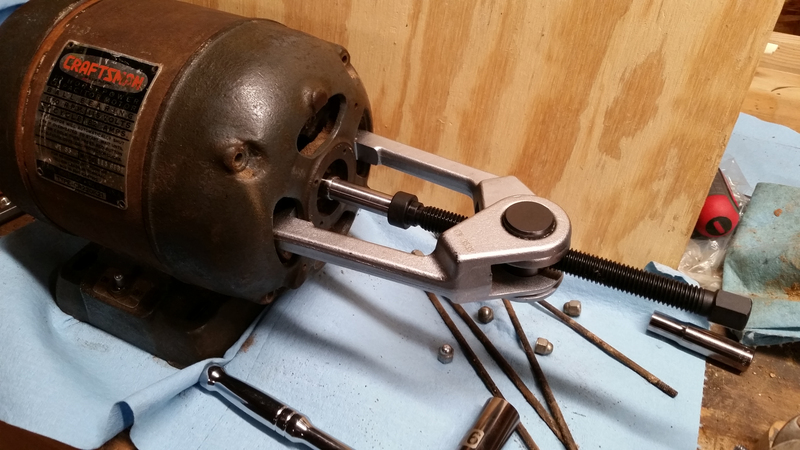 Using a gearwrench bearing separator from their front end service kit. With some careful maneuvering, I got the bearing separator into the air vents. I do not know that I really recommend this approach, as it seems easy to crack the end frame. Slow and steady pressure eventually got me some working room. I gently pried until I got the end frame loose. Once I had the end frame open, I had my hands full and forgot to take pictures, but I basically just pulled it apart gently and worked the rotor assembly out the right side. I simply lubed and pulled the bearings off a little roughly, as I was planning on replacing them. They didn’t put up much resistance. New Departure 8502 original ball bearings. They’re shielded and sealed with felt on one side only (the inboard side) and are open on the outboard side. The inner race is extended on the inboard side. The N-D-Seal bearings featured an extended inner ring housing a permanently fitted felt seal intended to keep dust and debris out of the race. 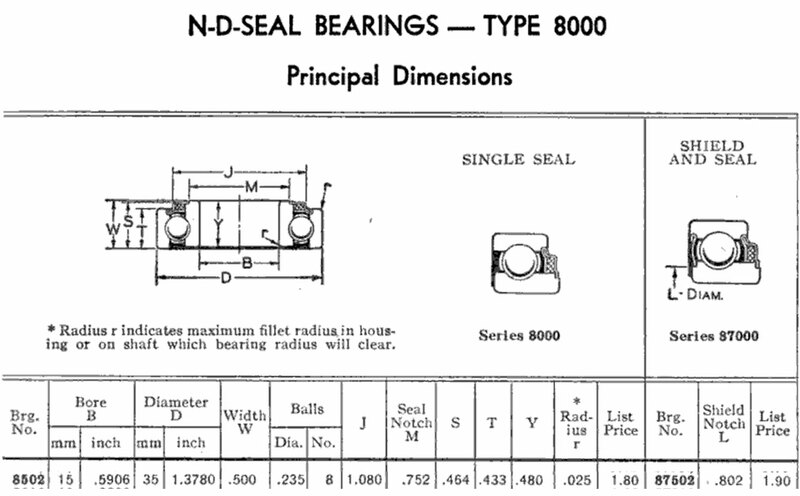 The opposite side of most N-D-Seal bearings (including the 8502) has an inset on the opposite side of the inner ring, for use in blind housings without necessitating a counterbore to fit the bearing. 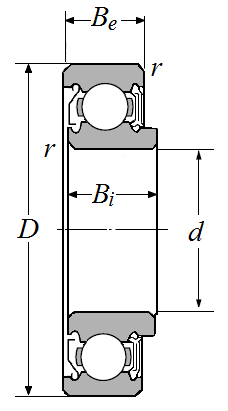 Smaller N-D-Seal bearings, when run at high speeds, work better under a light thrust load, and a small steel spring may be used. Under medium and low speeds, like we see in fractional HP electric motors, it is recommended to leave 0.015 to 0.020″ of clearance between the bearing face and the housing shoulder to limit excessive thrust load on the bearings. The ND Hand Book also suggests using a thin metal washer and felt ring to close off the shaft extension end, which we see was done on this motor. 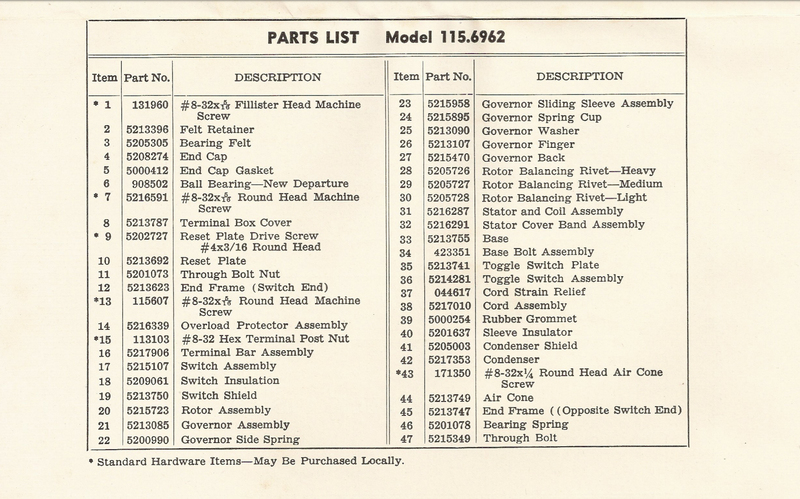 Original bearings for the 115.6962 motor were New Departure model 8502. (15 mm x 35 mm x 1/2″). Source: 1943 New Departure Hand Book. 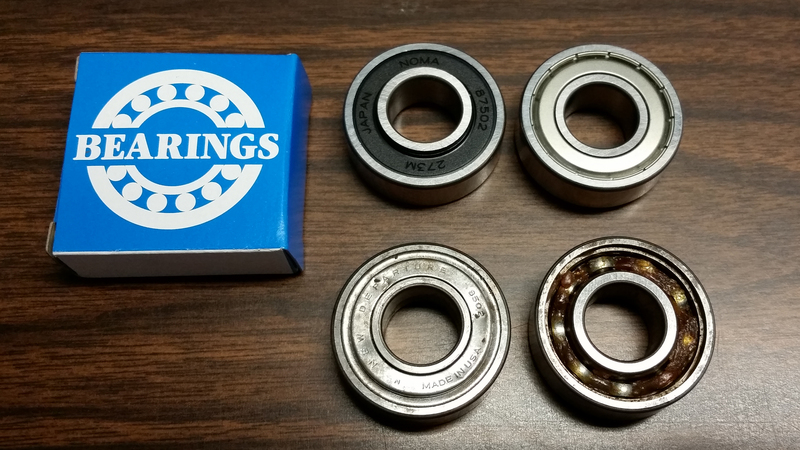 New 87502 bearings to replace the old ND 8502 bearings. 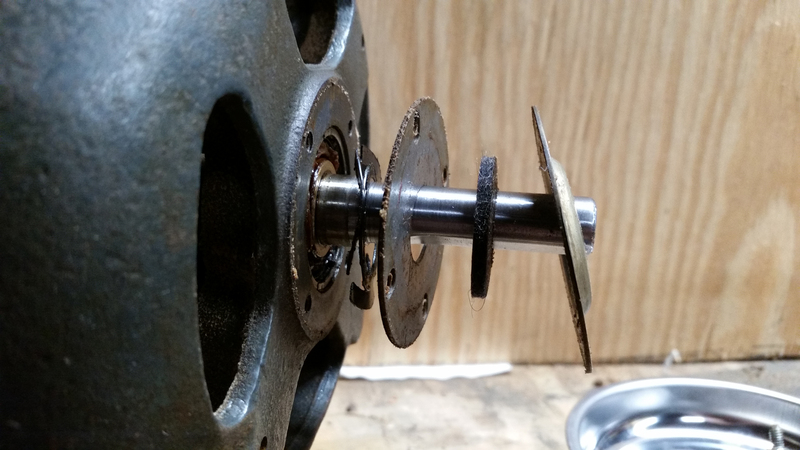 In the next post in this series, I’ll detail more about disassembly, cleanup, and reassembly, including installing the bearings into the motor. Thanks! Have one of these apart currently as well. Need a power cord to test it, but I might as well replace the bearings and prepare to replace the start cap. I’m glad you found the post useful, and thank you so much for contributing to the tip jar! I really appreciate knowing that I was helpful to a reader. I’m making progress on my motor, but I’m currently waiting on a replacement start capacitor from Amazon. It’s supposed to arrive within a few days. In the meantime, I need to de-rust and polish up the hardware (bolts and whatnot) so I’ll be ready to get it buttoned up. The center band on my motor was pretty rusty, and I think I may just paint it since the engine turning is wrecked. By the way, as far as I can determine, the old style flat capacitors are unavailable these days. I am replacing with a ‘130 – 156 uF x 110 / 125 VAC – BMI Start Capacitor # 092A130B125AC1A – Made in the USA’ from a seller on Amazon. It’s a cylinder style cap, so I am considering how I’m going to get it to fit. I started making an aluminum spacer frame to go under the motor mount, and I might go with that option. I hope you’ll keep an eye out for my future post once I get the motor back together! I have the motor set aside and not quite finished, but I’ve got some aluminum frames I’m cutting into  shapes, (like a picture frame shape, you know? ), that I’m going to shim under the motor with to achieve the clearance needed to have the cylindrical capacitor under the motor. Thanks, sorry I’m a few weeks late getting back to you. I get so much spam in the comments section (99 spams per real comment) that I sometimes miss seeing the real comments right away. 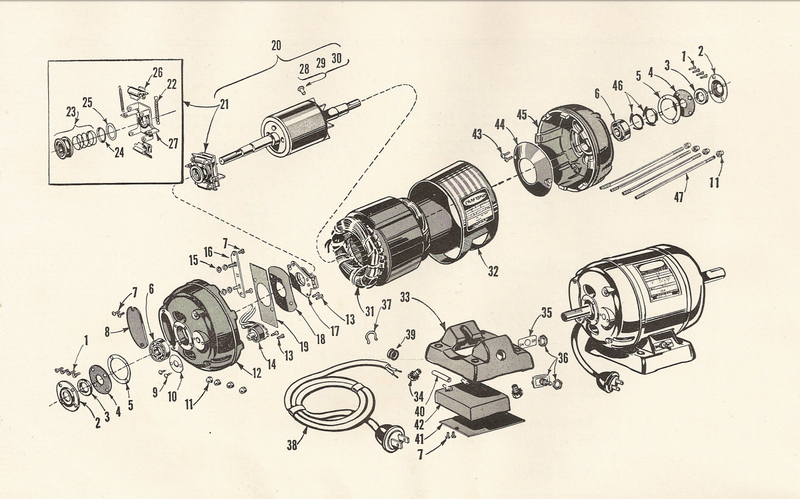 Hi Michael – I have a 3450 RPM version of the same motor and I am very interested to understand how to remove the bearings from the “switch end” of the motor. Can you elaborate on that? Hi Rich – I’m sorry I missed seeing your comment earlier. I get about 40 spam comments for every real one, and sometimes I miss seeing the signal in the noise. 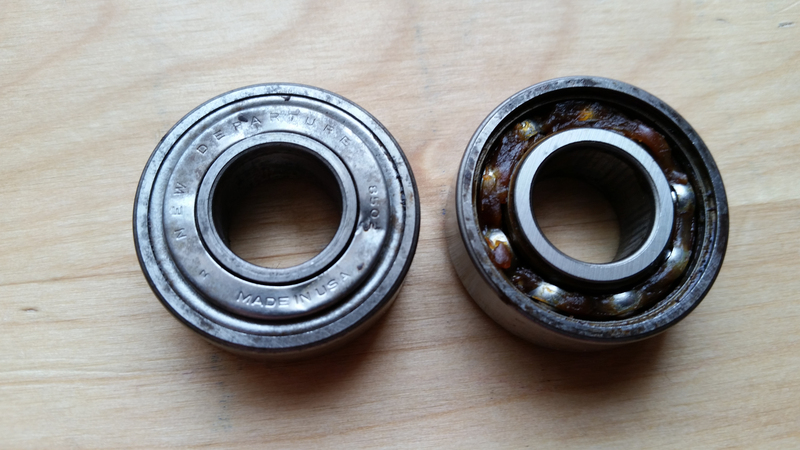 Hopefully you’ve already gotten your bearing off. If not, I found that I had to remove the non-switch end frame first, which I accomplished with a bearing puller, some risk, and some patience. I had to clean up the switch end of the rotor shaft as much as possible, because all the crud and corrosion made it hard to slip the bearing off. 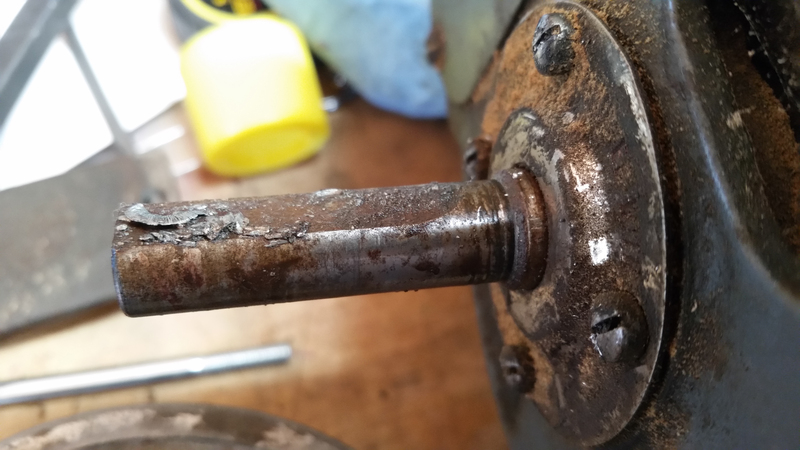 From there, I think it was just a matter of tapping the rotor and bearing back and forth until either the bearing slipped off and allowed me to remove the rotor, or I got a grip on the bearing and pushed/pulled it off the shaft. It’s been a while since I did it, but it should (ideally) slip through the end frame freely in either direction, and it’s just a snug interference fit between the internal bore of the bearing and the shaft. I think I just manhandled it off and ruined the bearing, which I was intending to replace anyway. I hope this helps you! I need to post part 3 of my repair, but I’m just swamped with work right now, so I haven’t had time to write it up fully.